I hope that you are ready for the standard picture overload of a finished quilt, although I must say it was tricky to get a good photo of the whole quilt due to it's size. The finished size of the quilt is 65 inches x 80 inches with each of the finished squares measuring 5 inches x 5 inches; a simple quilt design. This quilt is all about the fabric and it felt great to be upcycling these vintage fabrics, in addition to working with stash fabrics. The back of the quilt is pieced and features a horizontal panel of patchwork squares from the same fabrics as used in the quilt top. The straight line quilting grid is a set of double lines of both sides of all seam lines (completed in an epic quilting day - really, this took hours). I couldn't resist completing this quilt with a black/white striped binding. This quilt has already been shipped off to it's new owner and is destined to be used in a remodeled 1880's farmhouse. I couldn't think of anything more perfect. It makes parting with this quilt so much easier. I've spent some time tidying my work space. I even cleared my cutting table to reveal it's surface, all in in preparation for whatever may be next. It's really lovely. Great job! Simply lovely in every way!!! 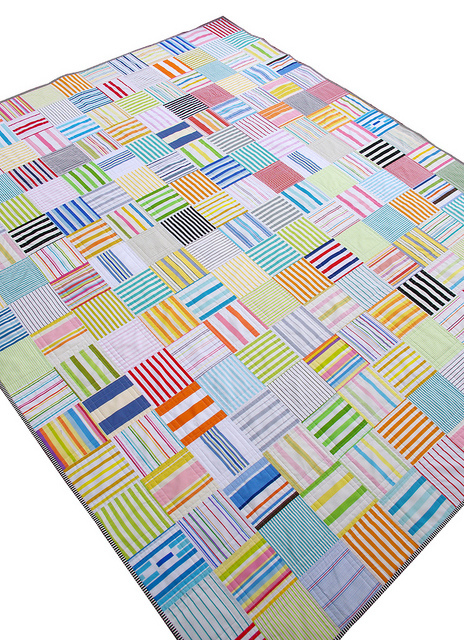 I love all the stripes, you really are my favourite quilt maker. I have yet to make a quilt myself as I have only just started sewing but I fall into the contemporary design side and draw lots of inspiration from you so thank you! This is stunning, well done. Really a knockout! The new owner is very lucky. I would have had a hard time parting with this one. Very pretty, and the binding is just perfect! Totally swooning. It's not often we get to see a quilt that feels completely perfect. Great job!! That looks amazing. When I saw a peek of it the other day, I didn't really think I would like it so much. Seeing the whole thing, I really, REALLY love it!! 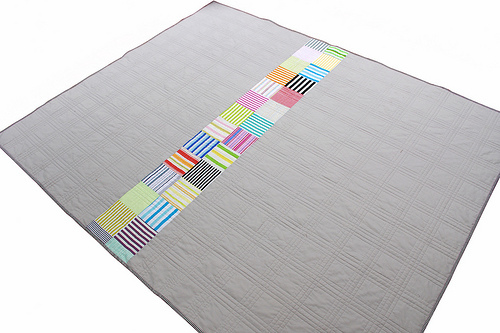 Your striped quilt is stunning! I love the colors and "movement" the stripes give. Wow! That is awesome! I've been wanting to make a dotty quilt. 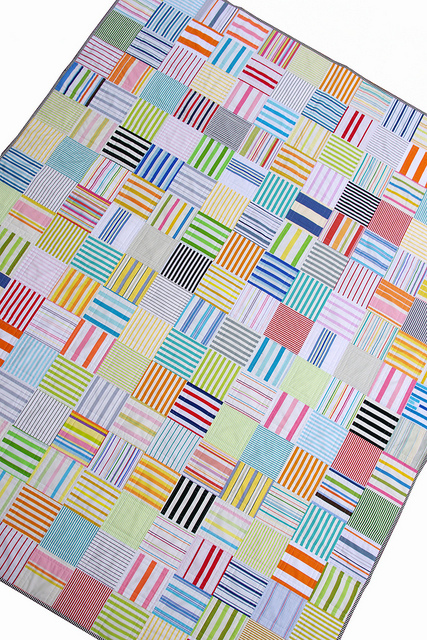 Now, I'm wanting to make a stripey quilt too! What am amazing quilt. It must have been very hard to part with. I love the fabric and the quilting is perfect!! Lucky, lucky new owner! I love this. As always, a simply wonderful quilt! Yes, please share your techniques for creating such professional-looking photos! Your quilt is just beautiful! So simple, yet stunning. It would be so great if someone would recreate all the fabrics you collected into one collection. I'd love to make this quilt but gathering all the fabrics would be a challenge. What a beautiful quilt. It's simply stunning. Just looking at that quilting hurts my neck! In one day?! You are insane. Or just very fit and strong, lol. I know this is going to be loved! To be used in a farmhouse. How perfect. Charming! Love this quilt! I was wondering if the square that is third up from the corner of the first picture is from a vintage sheet or is it a fabric line? I love it. It is the blue and white square with a broken stripes. I cannot let my 6year old see this. She is striped obsessed! Love this one. 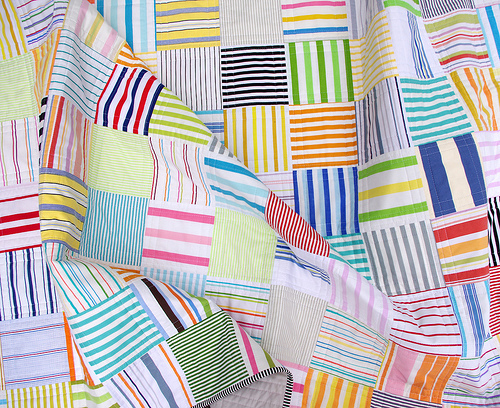 And love that broken blue stripes fabric. I really love the way that turned out. 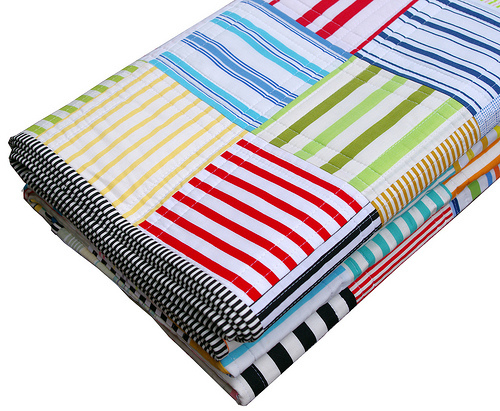 I struggle with using striped fabrics sometimes but this give me insights into new possibilities. Thank you.